Even more than in other Titanick productions, music takes the leading role in the FURNACE SYMPHONY. 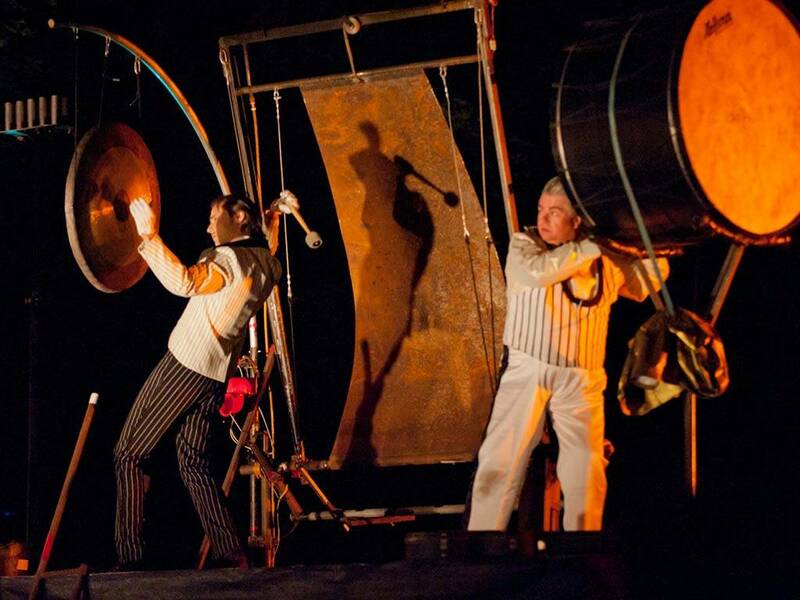 On a stage that is formed of three steel furnaces, the Titanick musicians make steel ring out. 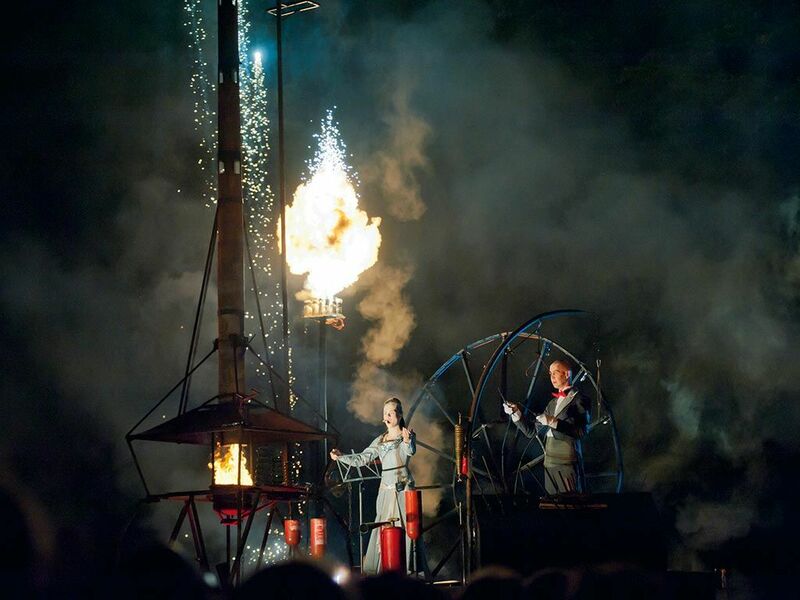 A rhythmical choreography performed on weird and wonderful instruments, grotesque Titanick acting, fire effects and pyrotechnics turn this symphony into a performance delightful to ears and eyes alike. 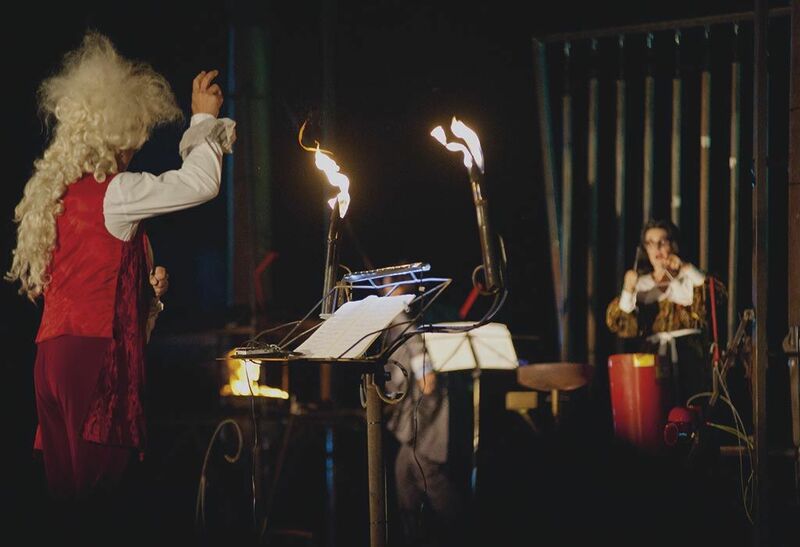 A metal construction made of steel furnaces, fire boilers, chimneys and pipe systems form the stage for the musicians of the Titanick orchestra, composed of extravagant musicians under the guidance of a bizarre conductor. The orchestral pit is lifted onto the stage and the players in their vanity and competitive spirit run the full gamut of human emotions. They struggle with the resisting material and the conflicts between each other. But music unites them all and the complex score spurs them to rhythmical perfection. 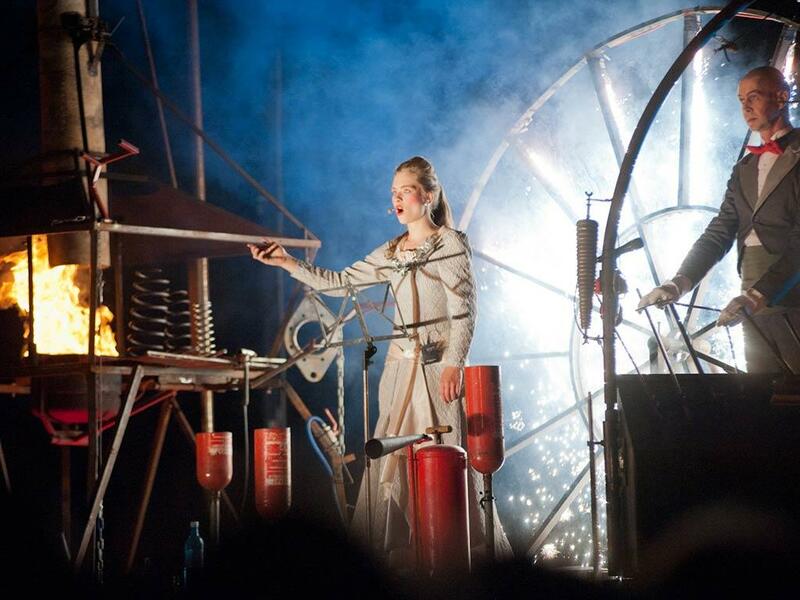 The furnace symphonists sound their steel instruments with iron bars, welding torches, whirling sheet metal and vibrating rods. And in time to them chimneys spout fire, sledge hammers spray sparks and welding guns unleash their lightning flashes. In a song of poetic beauty the lovely singer rings in the finale with its wild flames and pyrotechnical effects rising in time to the music. 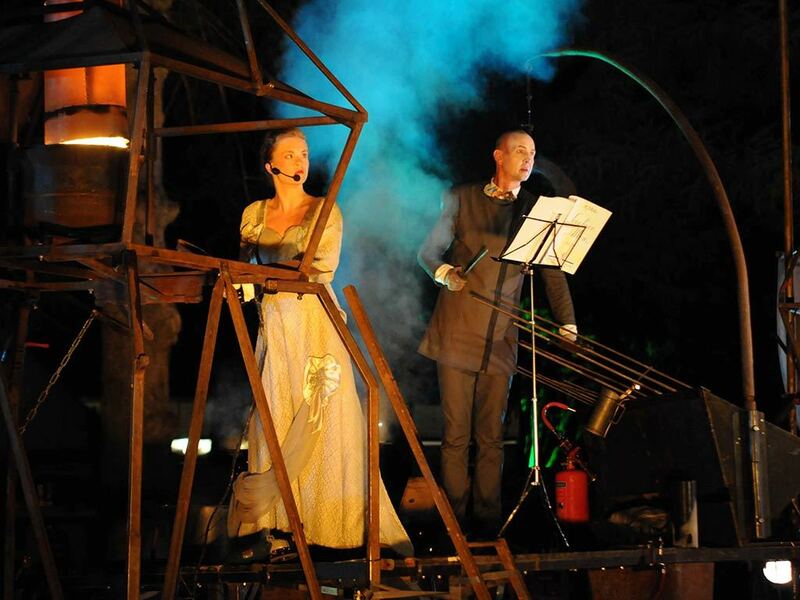 The furioso of instrumental sound, song and fire is a climax of visual and acoustic delight. © 2011 H. Teupel / Film & TV Produktion. The use/copying of this Youtube video is only possible with Theater Titanick’s express permission. 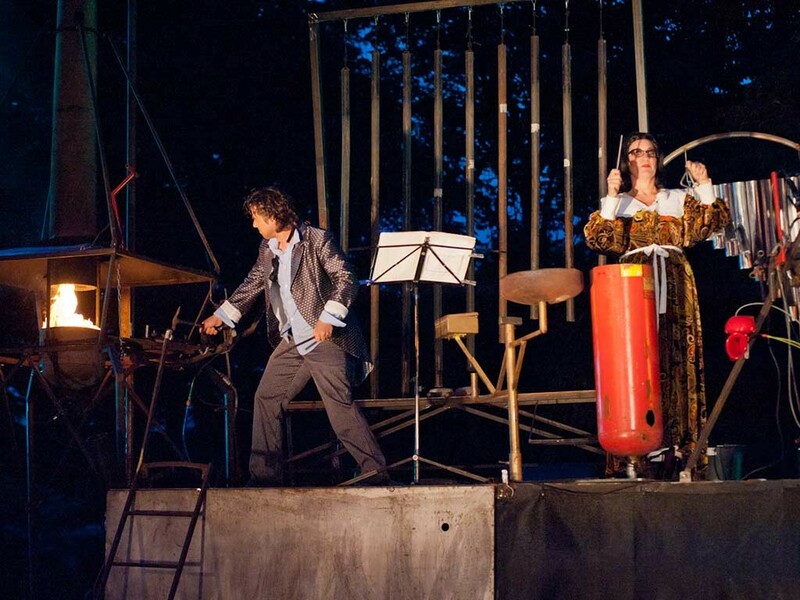 Under the guidance of the conductor, the musicians play on archaic instruments of steel from the Titanick workshops: a gas organ – its metal pipes made to boom with three propane gas burners, a billowing sheet of steel that produces a swirling sound when struck with metal rods, a giant-sized kalimba with vibrating steel braces that twang and whir in a wooden resonance box and nine massive scaffolding pipes, perfectly tuned to form oversized chimes. 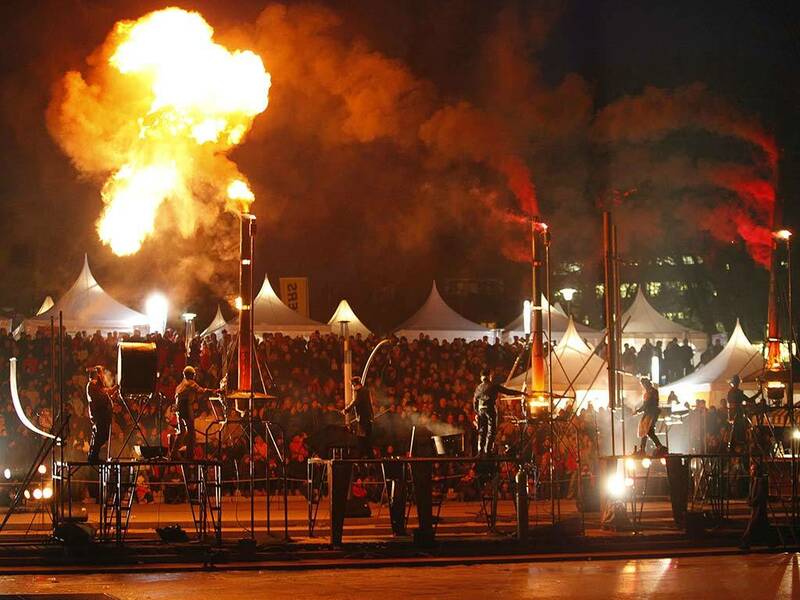 The instruments are placed on a 30-metre-long stage construction of steel and sheet metal, bearing three steel furnaces with their cauldrons and chimneys. The music covers a wide span from archaic sounds to orchestral classical music, magnificent solos are followed by fast-paced ensemble passages.